The following was submitted by the Angelica Duenas for Congress campaign. Publication does not constitute an endorsement. Angelica Duenas is the Green Party candidate running for Congress in California District 29. This district includes Arleta, Lake View Terrace, North Hills, North Hollywood, Pacoima, Panorama City, San Fernando, Sun Valley, Sylmar, and Van Nuys. Angelica was born in and raised in Sun Valley, the daughter of Mexican immigrant parents. Mr. and Mrs. Duenas struggled to support their family of 4 working as many as 3 jobs between the two of them. A defining event in Angelica’s childhood was the loss her mother’s job in 1997 when Angelica was only 14 years old. Her mother had worked 21 years for Price Pftster at that point, and planned to work there until her retirement. This was the family’s greatest stability. The massive layoffs that took her mother’s job along with millions more, were the result of NAFTA. Countless companies, and jobs were driven out of our country, to never return. This family crisis sparked 14 year old Angelica’s lifetime commitment to fight for social justice. Angelica attended San Fernando Valley public schools. Beginning at Roscoe Elementary School, then Robert E. Byrd Middle School and graduated from John H. Francis Polytechnic High School. Then earning her Human Resources Professional Certification from L.A. Valley College, her Bachelor’s Degree in Political Science-Public Administration from California State University, Los Angeles, and finally her Master’s Degree in Organizational Leadership from Woodbury University. Today, Angelica works as a Human Resources Manager at a retail company in the San Fernando Valley. Married to Henoc Sanchez since 2006, they divide their time between full time employment, political activism, and raising FIVE healthy children. Presently, Angelica Duenas is a contributing Board Member of the Sun Valley Neighborhood Council. From May of 2010 through August of 2013, she served there as 2nd Vice President, Vice President and then President. Angelica was elected and served as a Delegate for U.S. 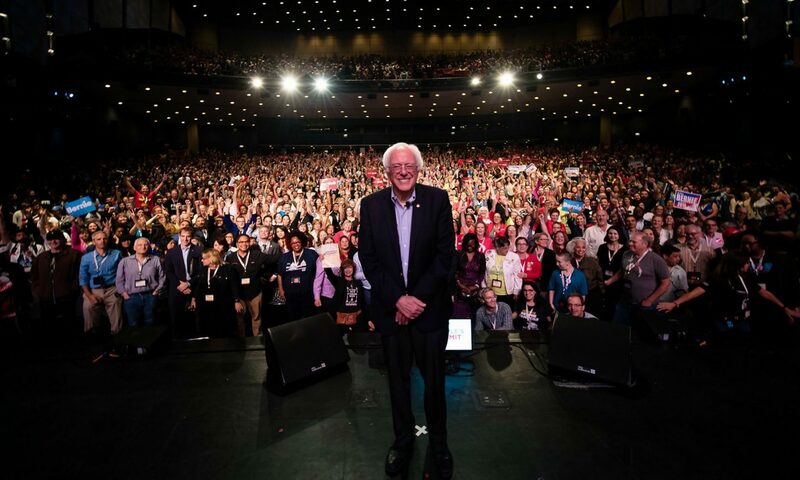 Senator Bernie Sanders at the Democratic National Convention during his legendary 2016 Presidential run. It was during this experience that Duenas became painfully aware of the limitations of the two-party political system in American politics. This compelled her to officially join the Green Party and begin the work of political reform. During the Fall of 2016, Duenas was hired and served as Southern California Campaign Coordinator for the Jill Stein 2016 Presidential Campaign. She is an active Council Member at the Green Party of Los Angeles County. She knows that the priorities of America’s working families will be not be seen in the U.S. Congress and within our government until voters elect members of America’s working class to Congress and Senate. As a member of Congress, Ms. Duenas will fight for policies and deliver results that bring tangible improvements to the lives of her San Fernando Valley constituents. She is committed to providing national healthcare. She will fight to implement humane Immigration Reform policies that treat hard-working people and their families with both the compassion they deserve and the principles of fairness that every American values. She will work to end homelessness in the greater Los Angeles County area, incentivizing job creation and affordable housing construction, while simultaneously ensuring that vital social service programs receive full federal funding. Angelica Duenas will work for federal electoral reform legislation that instills integrity into our nation’s voting process, from primaries through general elections. She will fight to guarantee that no election is rigged, that all votes are counted and that all voters have unimpeded access to the ballot box. She will advocate for a humane foreign policy that is based on the fundamentals of human dignity and peace. We need and deserve a strong human rights activist as our Congressional Representative. Angelica Duenas is that person. For Peace, People and Planet. Please Vote Duenas, Green Party, For Congress.